What is it about? Directed by James Gunn, Guardians of the Galaxy Vol. 2 takes place a few months after the (amazing) first movie. The newfound family of Guardians are working as heroes-for-hire. Meanwhile, they are struggling with their family dynamic, as Peter Quill/Star-Lord (Chris Pratt) learns about his paternal heritage when the mysterious Ego (Kurt Russell) emerges. All the while, the seemingly idyllic society known as the Sovereign are on the Guardians’ tail as a threat. How is it? 8.4/10 Guardians Vol. 2 is spectacular. It tries something different from the first one and still manages to be pretty awesome. 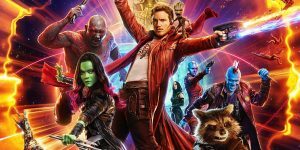 Guardians brings much more of what we loved, packs emotion, and most of all, looks into its characters, giving them each their own arcs. However, it isn’t flawless, as it lacks the urgency in story of the first. The Ups One of the best things about Vol. 2 is that it tries something new, adn takes on a new tone: it still packs a ton of fun, but deeply explores its characters by splitting them up. Speaking of which, the characters are just fantastic, being the highlight of the first movie. It truly looks into them and their issues. 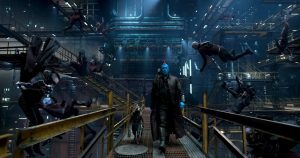 By the end of the movie, Yondu (Michael Rooker) became one of my favorites and was terrifically developed. Star-Lord and the realization of having a father is really dug into. Gamora (Zoe Saldana) and the dynamic with her resentful sister Nebula (Karen Gillan) is explored as Nebula shares just why she hates her sister. Even Rocket Raccoon (Bradley Cooper) gets his own satisfying arc. This movie packs a heck of an emotional punch-it’s incredibly touching at the end, probably being the most emotionally impactful in the MCU. The characters in this, as I said before, are great. Star-Lord is charming and well-acted. Kurt Russell is perfectly cast as Ego, and super charismatic. 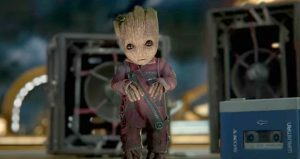 Baby Groot is just about the cutest creature ever seen on screen. Every scene he was in made you either have a giant grin, burst out laughing, or say “Aww” repeatedly: he’s used brilliantly. 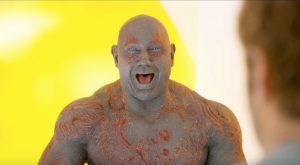 Drax (Dave Bautista) doesn’t have a ton of development, but he’s really funny. Emotion-detecting Mantis (Pom Klemetieff) is just delightful and hilarious. Rocket gets great moments as well. I’ll say it: this is the funniest Marvel movie yet. So many of the jokes work, and it’s because of the same reason as the first movie: the characters and their interactions. 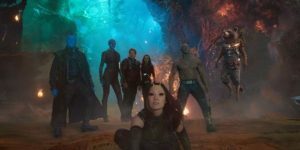 Drax is given a ton of great lines, as he interprets everything literally, and Baby Groot and Mantis are for sure highlights. Some of Drax’s humor is a little too hit-or-miss, however. The action in Guardians 2 is dazzling. It has many breathtaking set-pieces, and the entire third act is just an action spectacle. The visuals are some of the best in Marvel and are up there with Dr. Strange: they are wonderful and weird and eye-popping, and the use of color is very vibrant and distinct. It is incorporated into the action exceptionally and the 3D is surprisingly great. Finally, the soundtrack is just like the previous: full of super catchy hits from the 70s and 80s. The use of it in the movie is super creative, just like the last movie. The Downs The main down with Guardians is its plot. It lacks the same simplicity and sense of urgency as the first; there’s no real story until the end of the 2nd act, and you don’t really know what it’s about. It’s slightly messy as well: it moves from scene to scene without a clear plot, feeling a little choppy. This provides for a sense of madcap, frantic fun, but the movie almost has to compromise the plot to be as fun. 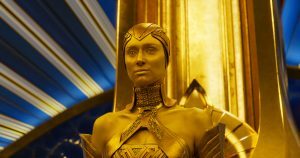 The Sovereign is also messy and underdeveloped- they show up at random parts of the movie without a clear purpose, acting as a pest. Sometimes, the humor gets a little too much as well; some of Drax’s jokes don’t work and try too hard. Overall, Guardians of the Galaxy Vol. 2 is fantastic. It tries something new by looking into its characters and passes with flying colors. It also doubles on what we loved about the first, with dazzling visuals, breathtaking action set-pieces, some of the funniest jokes in the MCU yet, a great soundtrack, and a really touching emotional payoff. However, the plot is unfocused and aimless at times, putting it slightly lower than the first. I hope to check out the movie soon. From your review, it sounds amazing. Just like you said, the colors and the music really stood out in the trailers. Thanks for the info! This person’s reviews are absolutely amazing. He really describes the movies with no prejudice and gives the reader a with a great view of the movie!